Dylan Elias is illuminated by the light from an outdoor LED lamppost near his bedroom window. As he struggled to fall asleep one night a few months ago, Dylan Elias noticed something odd in the second-floor bedroom where he has slept since he was a boy. The lights were off, but it remained bright in his room, as if the sun were shining through his windows. 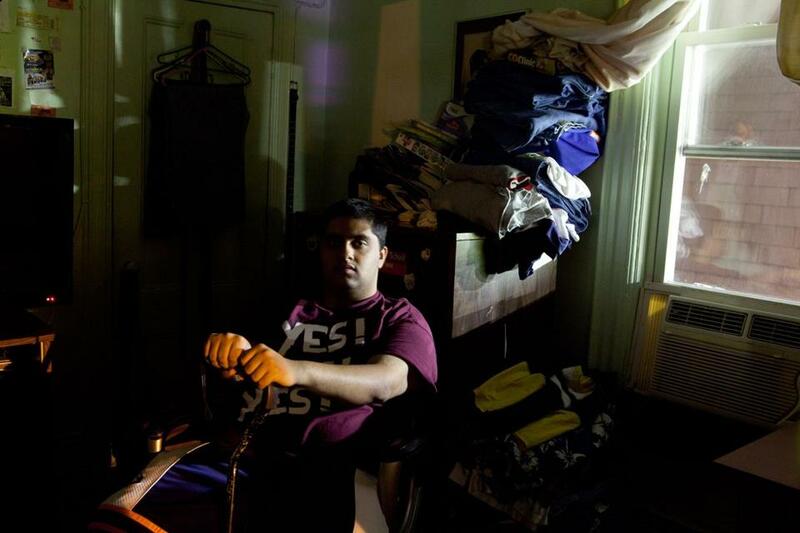 “It was like my eyes were busted,” said Elias, 20, who has since covered the windows with large furniture and heavy shades to reduce the new glow from ­Jamaica Plain’s Centre Street. Over the past year and a half, Boston residents from Charlestown to Mattapan have been adjusting their eyes to a bright white light bathing the city at night, the result of a multimillion-dollar project to replace all of its roughly 60,000 electric streetlights with more efficient, brighter fixtures equipped with LEDs, or light-emitting diodes. Public works officials have already replaced about one-third of the streetlights, which they say will reduce energy costs, deter crime, and replace a sallow light from mercury- and sodium-vapor bulbs with more vibrant, true-color lights they hope will retain their brightness much longer. But critics of the new lights say they produce so much glare that they can momentarily blind older drivers and reduce depth perception. And some residents complain that the sterile light makes it difficult to sleep and gives their apartments the feel of an operating room. “Boston is on the leading edge nationally of implementing a comprehensive LED street-lighting conversion,” said Jim Hunt, chief of the mayor’s office of energy and environment services. All the new lights are expected to be installed by 2015, but the city will leave its 2,800 gas-powered lights in Beacon Hill, Bay Village, and Charlestown. City officials have spent about $7.5 million so far, although they expect to receive rebates from NStar to cover about half the cost. Each LED fixture runs between $250 and $500, depending on the wattage, compared with $125 to $300 for the older lights. The LEDs, however, could cut the city’s utility bill for streetlights by as much as 60 percent, making the more expensive lights pay for themselves in about two years, city officials say. And they expect each fixture to last about 15 years — though they are guaranteed for just five — compared with about five or six years for the older lights. The new streetlights also require less maintenance and diminish the amount of ambient light that escapes into the sky, making it easier to see stars. LEDs direct 90 percent of their light downward, which reduces shadows and the need for greater wattage, city officials said — though adjacent homes and businesses can still be illuminated. Boston police Superintendent in Chief Daniel Linskey added that the lights are helping to make city neighborhoods feel safer and may have already played a role in cutting crime. He said that assaults, burglaries, and car thefts have fallen by 9 percent in the first six months of this year compared with the same period last year, although he said police have not done any studies to make a connection between the increased light and the drop in crime. He said the brighter light has made it easier for witnesses of crimes to provide police with more accurate descriptions of suspects and getaway cars. Boston is among a growing number of cities — including Seattle, Los Angeles, and Pittsburgh — making the transition to LEDs. But some researchers and engineers who have studied the lights warn that they present risks. They have also questioned whether they will last as long as their promoters claim. Studies have shown that bright LED streetlights that lack a bottom cover to diffuse the light — such as those installed throughout Boston – are significantly more likely than conventional lights to temporarily impair the vision of older drivers, whose pupilsdo not adjust quickly to big changes in brightness. “The older you are, the more dangerous it is,” said Steven J. Orfield, president of Orfield Laboratories in Minneapolis, which has studied the effects of LED streetlights. In a study of such streetlights in Minneapolis, he found that a 90-year-old driver was 200 times more likely to be disabled by the glare than a 50 year old. “We argued that these lights discriminate against the elderly,” he said. Boston officials said the lights, which have already been installed in nearly every neighborhood, meet or exceed safety guidelines established by the Illuminating Engineering Society, a New York organization that promotes national lighting standards. They added they have received only about a dozen complaints since beginning to install the lights in late 2010. They also said that LEDs, unlike the other lights, can be adjusted to reduce glare. On Hyde Square in Jamaica Plain, some residents complained in interviews that the new lights make the neighborhood feel like a mall parking lot. At first, Eli Latto, 26, was annoyed by the bright lights shining into his living room from the rotary on Centre Street. But as he got used to them, the LEDs began to blend in with the landscape. A previous version of this story misstated the gender of Eli Latto.